Viewing topic "motif xs and logic pro 9 setup?" There is a lot of info pertinent to Logic and the whole Motif family in this forum. What steps have you already taken to get things going? Hi, I have the Motif XF and want to connect to MacBook Pro with Logic Pro X on Yosemite. I connect both via USB and on the Motif i select USB for Midi and install the Yamaha driver on the Mac. Now I have an Midi File I want to play and edit on Logic but the Motif don’t plays the Midi data and don’t switch the sounds. If the Motif plays the Mididata from Logic I have another question. Is there like a record switch on Logic, if I switch a sound on the Motif while playing, automatically Logic knows MSB and LSB and write it to the Midi File? Or like Cubase, that I can search the Sounds from the Motif on Cubase and he switch to this sound and saves it to the Midi file? The new MacBooks don’t have FireWire, but I think it works with Thunderbolt. If I connect the Motif via FireWire is it better than USB? If I connect the Motif via FireWire is it better than USB? The USB connection is MIDI only. The FW connection with the FW16e is MIDI and audio. The MIDI operation is the same either way. I follow the steps from Motif8mine to connect the Motif via USB to Logic and it works in new Midis, but i have old Midis i want to change the Instruments to Motifs internal sounds but it don’t works. If i start the Midifile on Logic the sound comes from Mac und the Motif don’t receive any Data. How can i play the Midifile on Logic and hear the Sounds from the Motif in this ready Midifiles? 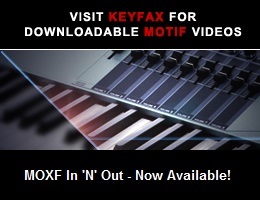 Motif is setup DAW Type Logic, and Midi in/out ist setup to USB. In the Quick Setup on SEQ Setup i have the number 3, but i try with all 4 and no reaction. On AMS i create an new Device with the name of my Motif and connect the Port1 out into the left in of the new Device. How i say, if i open a new Project in Logic he ask me what i want to do and if i put External midi with my Motif, it works, but not on the other ready Midifiles. Is there a way to find in Logic the Motif Sounds or must i search MSB and LSB and Programm number to change the Sounds? Please help, need to do this until Weekend. Ok, i found my mistake, I didn’t know I must change for each channel the internal Logic sound to external midi. But now I resolve this. The problem is, I’m very newbie in this area. I read about Studio Manager and Voice Editor. Does this only works with mlan, or USB too? Can I find with these both the Program Names of my Motif in Logic, or must I search the MSB and LSB in the Data List from Motif and put for each channel in Logic, after I search the Sound?